Don’t let your plumbing needs wait. Installations. Repairs. Pipes. Heaters. Leaks. Clogs. Overflow Plumbing does it all. Pick the Louisville plumber who cares! Our team provides fast emergency plumbing repair service calls Monday through Saturday. Give us a call and we can take care of your plumbing problem the same day. Whether it’s a basement filling up with water due to a sump pump not functioning correctly or a broken water line, we have the tools and expertise to make the necessary repairs in a professional and timely manner. Our policy is to leave our jobs cleaner than they were when we arrived and provide polite and courteous service in a timely manner at the right price. As old, cast iron and galvanized pipe degrades and rusts away it becomes necessary to replace it with with PVC. You will notice small leaks begin to appear and you can easily spot these by looking for rusty water stains that may run down to the underside of your drain and vent pipes. As these lines age they may also clog up with oils, soaps, food particles etc.. to the point the inside diameter of the pipe may only be as large as your thumb. We provide free estimates so give us a call if you believe its time to replace your old drain, waste or vent pipes. We install and service all makes of louisville water heaters residential, commercial, gas or electric water heaters in Louisville, KY. We can take care of your 40 gallon residential heater to a 75 gallon commercial or even tankless heaters – NO JOB IS TOO BIG OR TOO SMALL. If you have a water heater not working properly and repairing rather than replacing the heater is possible we will do just that – unlike many plumbing companies who would simply recommend that you replace the heater. Honesty and integrity is our policy. Louisville’s long and rich history also comes with old and corroded pipes. Old houses contain galvanized and copper pipes which are prone to leaking and water damage. We have an eye for faulty pipes and can replace those old pipes to get your house up to standard in no time! Our experienced team has the knowledge and tools to clean your clogged drains including the smallest sink drains to your outside main sewer line. Tree roots entering through breaks in clay waste pipe and aging joints are the most common cause of blockages on your outside sewer lines. We utilize a technology that will find the blockage and safely remove the debris or root. Need help selecting or installing bathroom fixtures or kitchen hardware? 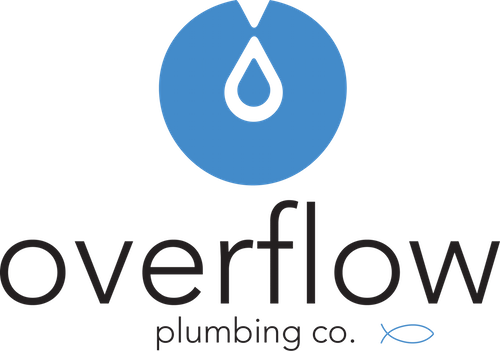 Overflow plumbing can install toilets, kitchen sinks, tub and shower faucets and so much more. If water runs through it we can do it! You can provide the fixture or we can assist you with selecting the right fixture based on your style preference and budget. For a free quote give us a call!